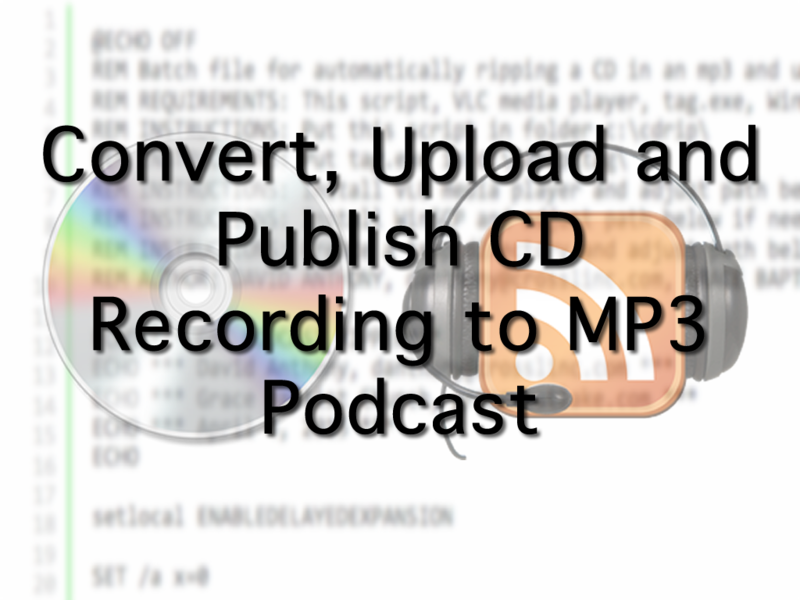 Convert CD Recording to MP3 Podcast - Through the Line, LLC. Many churches record their weekly meetings to CD for duplication and for creating podcasts that are then uploaded to their website or podcasting network. Usually, there are a number of steps involved…steps that a volunteer staff doesn’t have the time or experience to take every week. The goal of this process is to automatically upload an tagged MP3 to a church’s website, at the end of the service, without intervention from the staff. DISCLAIMERS: The process described below is several years old and needs to be updated, using modern scripting languages and software. It was written for Windows XP, but it’s been successfully tested on Windows 7 and Windows 10. As time allows, I’ll update it to use Powershell, and replace the REALLY old software with more suitable, current versions. I’d also like to add in some logging and notifications, via email or other method, but that’s currently too cumbersome using the batch file method below. Also, there is one step in the process that requires a password to be stored in plain text on the system being used, more details below. cdrip.bat (required) : A Windows batch file that I wrote. It contains all the settings and program calls that make the magic happen. Download and install VLC Media Player and WinSCP, using the default settings. CALL "%TAGPATH%" Track_all.mp3 --artist "%TAGARTIST%" --album "%TAGALBUM%" --title "%TAGTITLE% %mydate%" --year %YYYY% --comment "%TAGCOMMENT%"
ECHO option batch abort&amp;gt; "%TEMPDIR%ftpcmd.dat"
ECHO option confirm off&amp;gt;&amp;gt; "%TEMPDIR%ftpcmd.dat"
ECHO put "%MEDIADIR%%mydate%.mp3" "%WEBDIR%&amp;gt;&amp;gt; "%TEMPDIR%ftpcmd.dat"
REM Here's where the actual transcoding/conversion happens. Review settings at top of cdrip.bat and make sure they are configured for your specific situation. In Windows Task Scheduler, create a task that calls c:\cdrip\cdrip.bat once weekly. I’ve set it to occur 25 minutes after the service officially ends. Be sure to check the box allowing the job to run whether a user is logged in or not. Insert an audio CD into the CD tray and run the Scheduled Task manually. You should see a black command window popup and work it’s way through the cdrip program; ripping the audio tracks into the temp directory, assembling them, tagging the single MP3, and then uploading it to your website’s FTP or SFTP server. If you get stuck on anything above, leave a comment or contact me via Twitter (@crosslinc), and I’ll be glad to help in any way I can. Amazon recently reported that the 2017 holiday season was a big one for Alexa, selling millions of Echos & Dots. Your organization needs to be using this new distribution channel…TTL can help! Apps aren’t going away! From simple informational to custom Apps that support your business processes, we can help. We build for both platforms so you can reach the broadest audience. We hear this question (or some version of it) from Executives all the time. We build bridges between your systems, so they talk to each other, and provide you with direct access to data, reports, and analytics you need to make good decisions.